Many people have grown up with tales of giants, golden eggs, and gingerbread men. 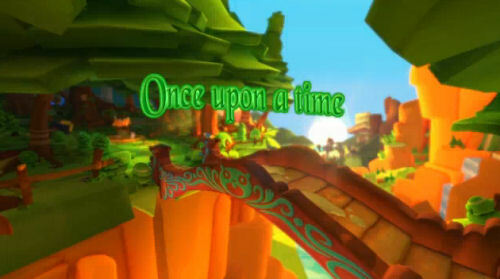 We are familiar with the tales, and now we've been given a game that bundles many of those things in a nice shiny new package titled "Fairytale Fights." You'll play as one of four characters: Red Riding Hood, Beanstalk Jack, Snow White or The Naked Emperor of the New Clothes fame in the world of Taleville. Your goal is to right some wrongs, and defeat the Tailor who has stolen all your fame by taking credit for all of your deeds. Sadly, fairytale creatures without fame cease to exist. We took a co-op trip into Taleville to ask Mirror, Mirror if this game is the fairest of them all, or deserves to be ground into bone-crunchy Giants bread. 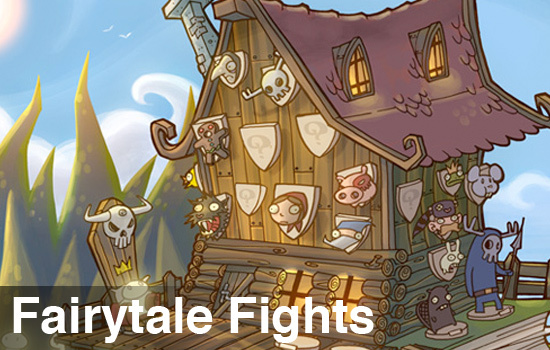 To make sure we're clear, Fairytale Fights isn't exactly a standard fairy tale...tale. You have all your familiar faces: Gingerbread Man, Hansel and Gretel, Fairy Godmothers, and others. These faces, however, are distorted and often mean. Hansel and Gretel are an oddly stitched-together pair of Siamese twins, the Gingerbread men attack you relentlessly, and the Fairy Godmothers have no issue with transforming you into a helpless inanimate object temporarily so she may wail on you uninterrupted. Twisted fairy tale figures for a twisted, gore-filled game. Not recommended for the kiddies, but an intriguing concept for the rest of us. Taleville is where you start out the game. Everything is peaceful, the menus are hidden in little un-labeled purple books, and you have to find your way around. Once you enter the game itself by interacting with one of these purple books, you'll hack and slash in the Lumberjacks land, fairy princess style areas, and in the clouds that the Giants call home. Each of these levels have a different type of enemy, as well as a unique platforming mechanic. Jump over pitfalls, maneuver through dangerous obstacles, and probably fall and die a lot. The platforming felt very broken in places, quickly frustrating even the most patient gamers. While playing through various fairy tale lands faced with various enemies, you'll pick up a plethora of weapons to use: pencils, scissors, swords, hammers, magic wands, etc. You'll "collect" hundreds of weapons, but the menu in Taleville won't show you names or stats of any of them, just how many of each type (slashing, blunt, magic, etc) you've picked up. Many of the menus have pointless information, statistics that didn't actually tell you anything about the game. As mentioned, these menus come in the form of little purple books, but they're not labeled, so you may have a bit of trouble finding what you need for a while. Inconsistency was also an issue with Fairytale Fights. When first entering the actual game, you see a lumberjack. This lumberjack is given an official introduction - he is "Lumberjack Bob." Then another Lumberjack enters the screen, also with a proper introduction. Then a Big Bad Wolf enters...with no introduction whatsoever, he just starts attacking you. This trend went on even as various evil Princes attack you, they all have a name, but you'll never know which one is which without the introduction. Death stats are logged in a Taleville book, it will tell you that you killed x prince so many times, but you don't know which one of the princes that was, because there is no picture next to his name and he had no fancy introduction. Little missing details like that seem odd to overlook, especially when so much effort went into keeping track of how often each prince, lumberjack, or brand of Gingerbread man has fallen to your mighty slashing pen.